Karraway introduces its range of Attached Lid Containers – strong, reliable and reusable containers for a wide variety of uses. 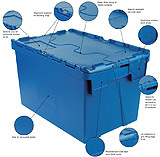 Designed by Rehrig Pacific, the world’s largest manufacturers of returnable plastic containers, the range comes with a superb pedigree. Designed to maximise loading capacity and for optimum nesting efficiency, the range is produced in tough, durable polypropylene for a long working life. Various identification options and security features allow complete flexibility and rapid integration with almost any operation. 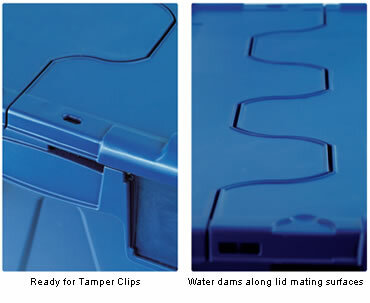 Tamper resistant hinge - Prevents container being forced open. Reinforced corner on lid - Prevents tampering and breakage. Contoured ergonomic handle design - Protects users and enhances efficiency. Sloping lid surface with water dams - Channels water away from lid mating line. Pin-dot texture on lid - Surface is easily washable. Tamper evident - Compatible with Tamper Clips and Loop Seals. Hinge towers protrude from lids - Ensure stability when stacking. Found a bug? Report it now to website maintenance.